The International Canoe World Championships were held as part of Travemunde week on the German Baltic coast. 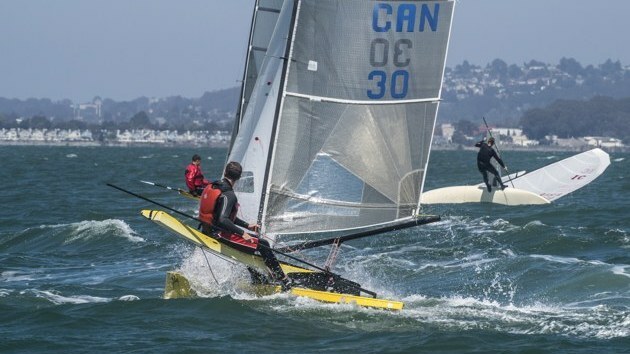 This is the first World Championship since the International Canoe class returned to the box rule format it has traditionally used after what seems a brief interlude of some thirty years with a one design hull shape. The International Canoes race in two divisions: the majority in the spinnaker free International Canoe, which comprises both boats built to the new development rule and the old one design rule set, and the Asymmetric Canoe (AC), carrying a large spinnaker and retaining the one design hull. The thirty-nine International Canoes were joined by the German Taifun fleet, which is a pre sliding seat style of racing Canoe. Amongst the ICs there has been little International racing between the strong International centres of the class since the new rules were adopted two years ago so there was really very little form book and a great deal of interest to see who would turn out to be fast. In the one design fleet form was better established, and UK sailors Simon Allen and Mark Goodchild were expected to do well, but be chased hard by the strong German contingent. Sadly the strong Australian fleet was largely absent with budget problems and surprisingly there was limited participation from Swedish canoes. The German fleet contained a strong contingent of female and younger sailors, all of which bodes well for the future as well as demonstrating the Ics tolerance for a large range of crew weights. Visiting competitors were met with unseasonable wet and windy conditions making the practise, measurement and weighing sessions uncomfortable and the sheltered opening ceremony was welcomed as the sun eventually came through for the start of the 18th ICF Sailing World championships. Although Travemunde has a reputation for strong breeze three of the race days featured fairly light and shifty conditions. The other two more than made up for that though! ICs: Monday was light. Chris Maas put down his marker for the event, winning the opening race in fine style, with Alistair Warren and Colin Brown from the UK 2nd and 3rd. Simon Allen (GBR) was the one design winner in 9th place, with Mark Goodchild next in 13th and Frederik Steinmann (GER) 14th. ACs: Steve Bowen (GBR, Wales) in his recently acquired "Seasick Steve" led from Dave Timson (GBR, Wales) for the first 2 laps with little to separate the Llandegfedd SC pair. The local rivalry was evident with the pair colliding approaching the leeward mark. This incident coupled with a large wind shift favoured the chasing Arne Stahl (GER) and Rob Bell (GBR) who managed to get a jump on the Welsh pair on the final downwind leg with Arne Stahl securing the win. ICs: Chris Maas took Race 2 as well, with Colin Brown second and Alistair Warren 3rd. Allen at 9th was first one design from Goodchild in 11th and Stuart Brown (GER) 12th.For Race 3 a chink appeared in the Maas armour, and Peter Ullman (GER) took the win, with Brown and Warren 2nd and 3rd again. Allen took another One design win from 7th place, followed by Steinmann in 11th and Goodchild in 12th. ACs: With a moderating and shifting wind Timson was able to work the shifts and find the pressure to ease his nose clear of the pack taking the next two races to complete the first days racing. 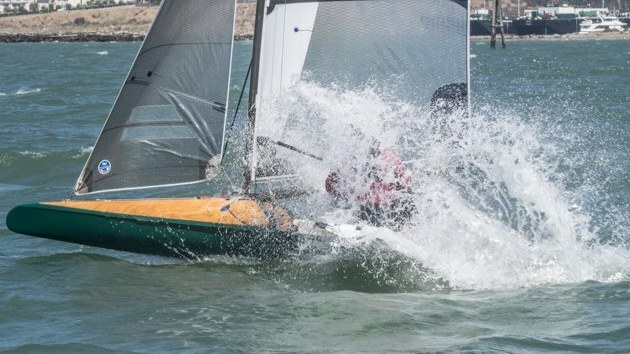 With the failing wind and a 3-mile upwind sail back to the beach the competitors were relieved to make the shore having sailed an eight hour first day session. Tuesday woke to no wind. After several delays a very decent sea breeze came in at around 18 -20 knots with quite big seas. ICs: Ullman took his second win with Maas second. Third was Chris Hampe (GBR), clearly relishing the breeze after a hard fight with Willy and David Clarke. Allen's 7th place gave him another OD win from Goodchild (8th) and Johan Elfstr�m (SWE)(10th). There were several minor injuries and breakages, and one, to Colin Brown, put him out for the day and so effectively ended his challenge in the series, very disappointing after being in second place and on equal points with the leader after day one. ACs: The increased wind strength favoured the heavy weather maestro Steve Bowen (GBR) taking his first win from Phil Allen (GBR). ICs: In a slightly depleted fleet Ullman lead round the track in a very close race, losing out to Maas on the last tack to the finish line. David Clark took third from Hampe. Allen was 5th, and first OD, Goodchild 6th and Elfstr�m 8th for 3rd OD. 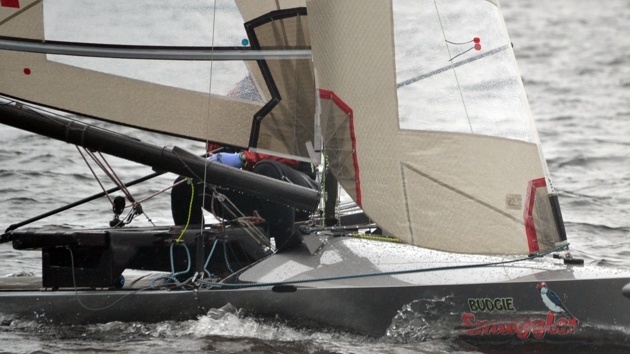 ACs: Rob Bell led from the windward mark with improved performance in the conditions from his square top Dynamic rig. 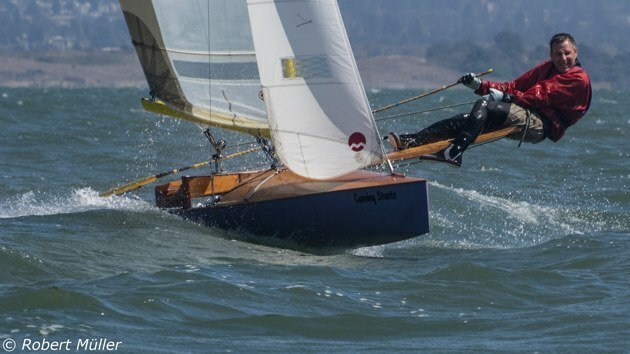 Rob narrowly missed out on his first Worlds win when gybing off to port he became congested and covered by the one-design fleet allowing Dave Timson to sneak another win. Only one race sailed in light airs: it started at around 9-10 knots and dropped sufficiently to preclude any more racing. ICs: Maas, first, Ullman 2nd again. 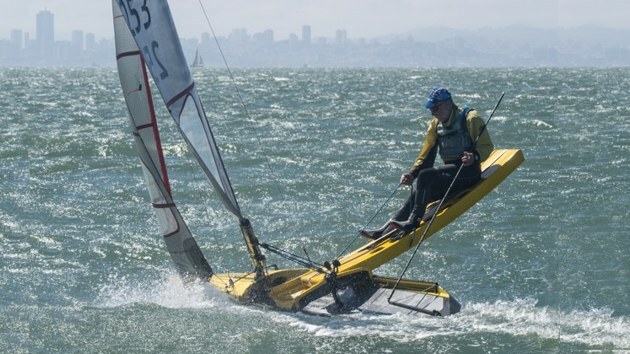 It was becoming clear that these two, both sailing Chris Maas designed boats with gybing daggerboards, had no intention of being off the top steps of the podium. Warren took 3rd place. Goodchild finally took a one-design win followed by Allen and Elfstr�m. ACs: Stahl found his feet downwind leading the first lap from Timson and Bowen. On the final lap Bowen found pressure inshore to gain a position on the last leg taking his second win from Timson by the narrowest of margins. Another day of light breezes. ICs: Race 7. Maas won from Warren and Ullman. Goodchild took a second OD race to keep the series alive with Elfstr�m and Allen 3rd. Race 8. Brown finally broke the Maas/Ullman stranglehold on first place, winning from Maas with Robin 3rd. Similarly Steinmann won his first one design race with Allen 2nd and Jan Stahl (GER) 3rd. R9. Maas won again, and took the trophy with it. Ullman was second and David Clark third. ACs: All 3 races saw wins from the consistent sailing of Timson securing the AC Worlds title with a real battle developing from the closely challenged 2nd to 5th spots. The final day and the sailors were met with their most challenging conditions of the event with gusts to 25 knots and very rough seas. 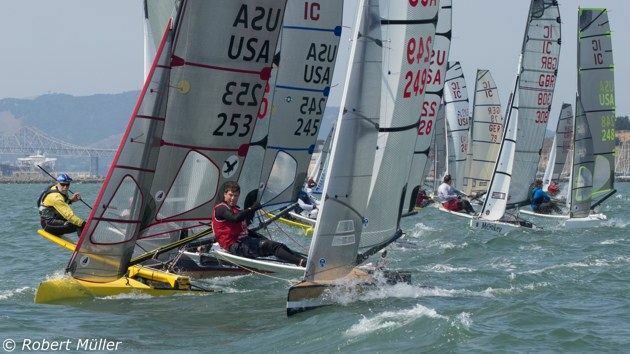 ICs: Chris Hampe port tacked the fleet at the start and led right to the finish. Willy Clark chased hard, but a broken spreader bracket towards the end of the race meant that he had to ease back to be sure of finishing. 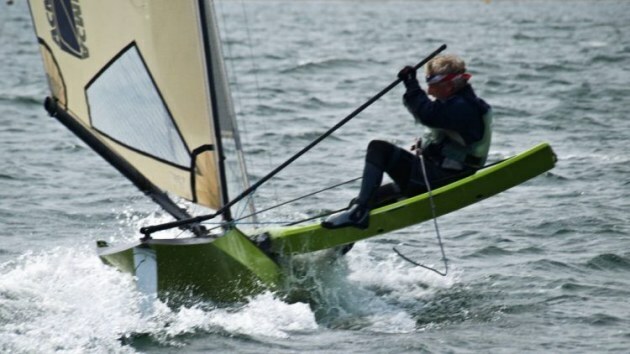 The ODs were more competitive in the big breeze and Goodchild took third place, Simon Allen 4th and Elfstr�m 5th. ACs: The waves were starting to take their toll on the fleet with kites staying firmly stored in their chutes after a number of pitch poles downwind. Pete McLaren (GBR) found the conditions to his favour leading the fleet around the course taking the final win from Steve Bowen. Arne Stahl finished third narrowly securing the overall runners-up spot by a single point from Steve Bowen who'd snatched the overall 3rd spot in the final race when Rob Bell failed to finish. With six wins it would seem that Maas' win was something of a walkover, but in truth he was racing and frequently changing places with other sailors, especially Ullman, but had the true Champion's knack of being in the lead on the last lap when it counts... The new boats, slightly narrower on the waterline and much lighter at 50kg dominated the results. Maas designs featuring wide sterns and U bows finished first and second, but its considered this was more to do with the sailors than the boats. The British entrants, which tended towards finer sterns and fuller central sections, were very competitive, especially in the lighter conditions, but some were suffering from a shortage of work-up time before the event. US rigs, featuring flatter sails on high modulus carbon masts, seemed to be more manageable in serious breeze than the fuller British rigs. Jim Champ (This report first appeared on the Yachts and Yachting web site).